"A mastiff is a manner of hound." What is a mastiff? In using the word 'mastiff' I mean the mastiff breeds, the broad-mouthed or 'modified brachycephalic' breeds of pure-bred dog that feature in kennel club lists across the world. The word 'brachycephalic' is used as meaning: having a relatively broad short skull (typically with the breadth at least 80% of the length). The expression 'modified brachycephalic' is used as meaning a reduced form of this, i.e. not as short as the truly brachycephalic dogs like the Pug, Pekingese, Boston Terrier and French Bulldog but with the breadth around 70-75% of the length and, especially, with the muzzle length being at least one third of the length of the head. It is important to establish that a number of breeds with mastiff in their title, such as the Tibetan Mastiff, the Spanish Mastiff, the Pyrenean Mastiff and the Bangara Mastiff, are not broad-mouthed breeds but belong in the Pastoral Group, as flock guardians. Undoubtedly, mastiff, i.e. 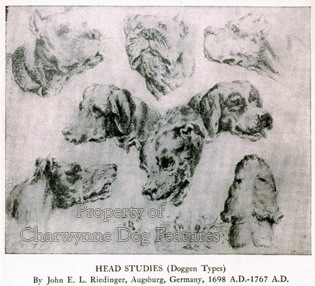 broad-mouthed dog's, blood was introduced into such breeds from time to time to infuse ferocity and strength, but their skulls are quite different from the 'modified brachycephalic' breeds. The Germans call the Great Dane a Deutsche Dogge or German Mastiff, but they mean a hunting mastiff or alaunt, not a broad-mouthed dog. 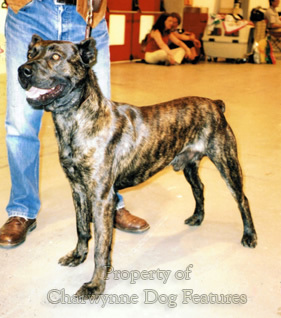 Such loose nomenclature continues to undermine the credibility of kennel clubs the world over, with even the international body, the Federation Cynologique Internationale (FCI), long embracing and quite mistakenly describing any dog with mastiff in its title or a 'modified brachycephalic' skull as a 'Molosser'. The original meaning of the word 'mastiff' is now agreed by most etymologists to be 'a large dog of mixed breeding'. This is in no way demeaning to the contemporary mastiff breeds and certainly not to the magnificent English breed of Mastiff; the word nowadays has a precise accepted meaning. But the historic use of the word in its original sense has led many breed researchers, when seeing a reference to the word 'mastiff' in old documents, into the false assumption that the reference was to the modern breed of that name. The word 'mastiff' is believed by some (e.g. Cent. Dict., Murray) to come from the French 'metif', in old French 'mestif', in Middle English 'mastyf' or 'mestiv', meaning mixed breed or mongrel. Others (e.g. the New Oxford Dictionary of English, 1998) consider it comes from the Middle English, obscurely representing the Old French 'mastin', based on the Latin 'mansuetus' or tame. Chambers's Twentieth Century Dictionary states it is from "an assumed Old French 'mastif', probably a variant of Old French 'mastin' (French 'matin'). Others explain as Old French 'mestif' (French 'metif'), of mixed breed, mongrel, or Old French 'mestis' (metis), mongrel, or even as the above Old French 'mastin' (Fr. matin) all, through Low Latin forms, from Latin 'mixtus', 'mistus', 'miscere, to mix." In the Dictionary of Word Origins by John Ayto, Columbia Marketing, 1994, it states that the word seems to have come into the language as an alteration of the Old French 'mastin'; mastin in time became 'matin', translated as a mastiff, a cur or a scoundrel, clearly no compliment. These original meanings should not be seen as demeaning to the breed of Mastiff today; pure breeding is a modern phenomenon. The Old French ‘mestif’ is more likely to be the original word, but the word 'dog' itself once meant a mastiff! Until the thirteenth century in England, a mastiff-type dog was called a 'docga', an Old English word, still retained on mainland Europe as dogge in Germany, dogue in France, dogg in Sweden and dogo in Spain. 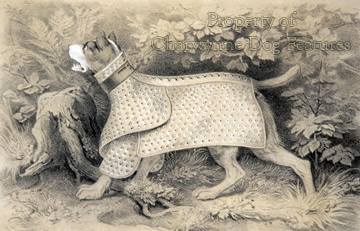 The master-engraver Ridinger portrayed the Englische Dogge at the end of the 17th century. No one claimed them as a breed, dogs then being bred for function not form, and never to a closed gene pool. In his The Cassell Dictionary of Word Histories of 1999, Adrian Room points out that the word ‘dog’ came from the Old English word ‘docga’ and was the name of a specific powerful breed of dog. 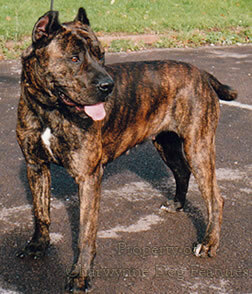 The word 'dogge', (pronounced 'dogga' and meaning a mastiff-type - not just dog), is therefore used here to avoid confusion by using the word mastiff, nowadays used precisely as a breed name, to refer to a powerfully-built, short-haired, large-headed, drop-eared, strongly-muzzled heavy hound or hunting dog with immensely strong jaws and a willingness to close with then seize and hold its quarry, rather than just chase it and then bay it. It is probable that the first dogs domesticated by man were hounds, not hounds in the manner of today's specifically bred animals but wolf-like creatures able to track or catch wild game. In time man developed a need for huge hounds capable of pulling down the bigger quarry such as deer, wild bulls, boar, buffalo and other powerful animals. As man settled and developed he found time for sport and bred dogs able to support his new pastime. 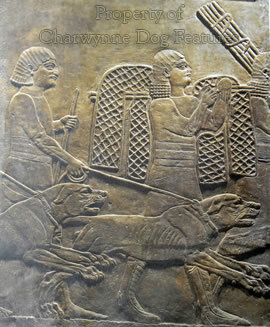 Valuable hunting dogs were traded and in due course breed types evolved to suit the style of hunting and terrain being used. When tribes migrated they took their hunting dogs with them. The history of dog is inseparable from the history of man. Against that background the development of dogs for a particular function can be traced. But it must be kept in mind that today's international boundaries do not always have relevance in breed origins and that the vigorous trade in useful dogs meant that hunters would always strive to obtain dogs more proficient than their own. The par force hounds, hunting using scent and sight, at pace, included some broad-mouthed holding dogs, the strong-headed, wide-jawed, modified brachycephalic type, used at the kill in medieval hunting and as capture-dogs since, the world over. These dogs have been used as hunting mastiffs or matins for over a thousand years. There are in addition however, what might be called 'running mastiffs', huge par force hounds which hunted using sight and scent, more often on boar. 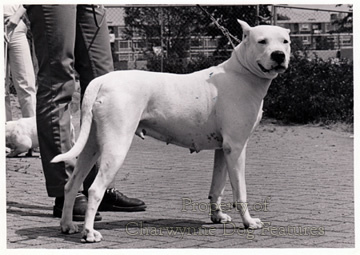 Their surviving examples are breeds like the Great Dane, the Dogo Argentino, the Rhodesian Ridgeback, the Broholmer of Denmark and the Fila breeds (although some of these were also used as cattle dogs and shepherds' mastiffs). These were hounds of the chase too valuable to be sacrificed at the kill, not trained or bred to be recklessly brave and prized for their looks more than any holding dog breed. They all excelled at 'steeple-chase-hunting' - following their quarry using sight and scent at great speed, over many obstacles, and deserve our admiration. 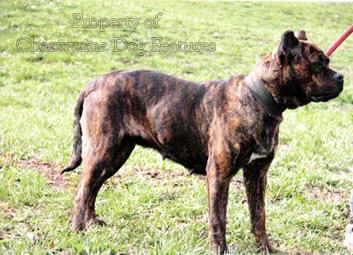 The kennel clubs of the world find it difficult to categorize such breeds, often classifying them as Working Group breeds. This is covered in a later chapter. 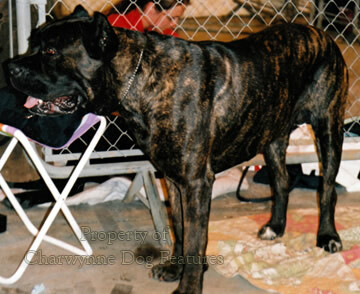 Because the kennel clubs of the world too bestow titles on breeds ending with the noun mastiff does not mean they are heavy hunting breeds or broad-mouthed ones. 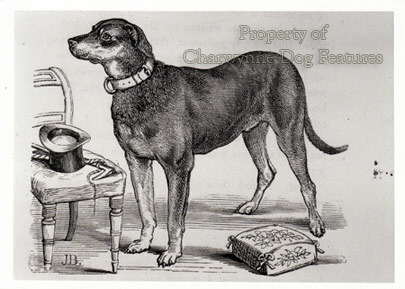 The recorded histories of most breeds of dog are usually no more than romantic fantasies, either conjured up by over-zealous breed fanciers or unwisely plagiarised from out-of-context quotations or mis-translated writings from the past. 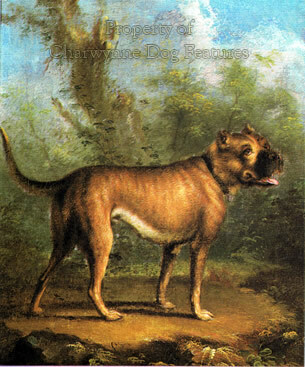 The history of the mastiff breeds is no exception, mainly through the tendentious and highly selective accounts provided by English Victorian enthusiasts like Adcock, Taunton and Kingdon, whose words down the decades have been reported as authoritative and factually correct. This lack of true research and intellectual honesty does scant justice to a distinguished group of dogs, rightly respected for their extraordinary bravery, admirable temperament, staunch character and formidable appearance. If you study informative and well-researched books such as: Hunting in the Ancient World by J.K.Anderson (University of California Press, 1985), Sport in Classic Times by A.J.Butler (Ernest Benn Ltd., London, 1930), Hounds and Hunting in Ancient Greece by Denison Bingham Hull (University of Chicago Press, 1964) and Bridleways through History by Lady Apsley (Hutchinson & Co., 1936), a number of key facts about the mastiff breeds emerge. 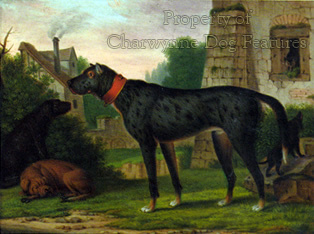 First of all, they were originally heavy hounds, used to pull down big game before the invention of firearms. There are well-known artefacts from ancient Assyria to demonstrate this. Secondly, there is evidence that they originated in what used to be called Tartary, were known to the Greeks and Romans as 'Indian' dogs or the dogs of the Hyrcani and were linked by ancient scholars to an area called Gurgan, near the historic silk route, now roughly where Iran, Turkmenistan and Afghanistan now meet. The Molossian dogs so revered by the Greeks and Romans were not broad-mouthed, 'modified brachycephalic', mastiff breeds but comprised two types of huge dogs: a flock guardian, rather like today's Pyrenean Mountain Dog, and a giant par force hound, rather like today's Great Dane. 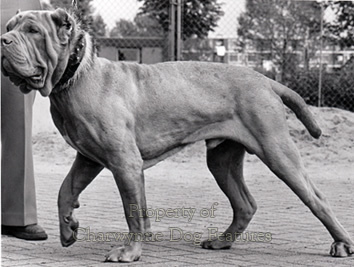 But once scholars lacking knowledge of dogs came across huge dogs described as Molossians, they made the giant leap of declaring all huge dogs, including the broad-mouthed mastiff breeds, as Molossians. This conflicted with the detailed well-documented references from the writings of a number of authorities, especially in Ancient Greece. The Assyrians predate the Molossi and left artefacts as evidence of mastiff ownership but still get little credit or no acknowledgement. 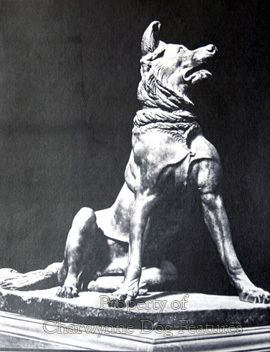 The Molosii lived in Epirus embracing the Suli Mountains; the Suliot Dog was prized as an outpost sentry by the Ottomans, noted by the Austrians and some became giant parade dogs in German regiments, one being used in Ireland in Irish Wolfhound breeding plans, after the King of Naples presented one to Countess Blessington. Lord Truro brought one into England. They are never mentioned in Great Dane breed histories but must have had a huge influence on the breed. 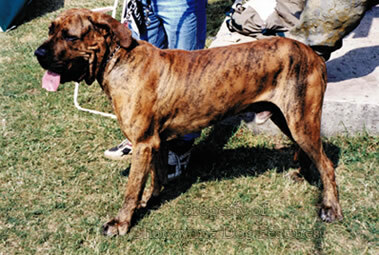 The Great Dane should be considered to be a 'molosser' but not the mastiff breeds; blurring origins confuses breeders desiring to fit form to function. As Professor Jan Libourel has pointed out, there is no evidence at all to support the claim that the Romans found mastiffs in Britain on conquering it. 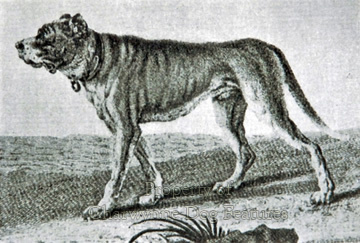 They found 'pugnaces', huge, heavy-headed, rough-coated, savage hunting dogs, rather like today's Irish Wolfhound only smaller and with a larger skull and heavier build. Such dogs were developed by the British and the Celts in a range of sizes. The myth that the Romans had a 'procurator' of dogs in Britain to send mastiffs back to the amphitheatres has long been exposed, either as a misprint or confusion between two words: gynaecii and cynegii; the official was in fact the Administrator of the Imperial Weaving Works. There is little evidence too of the Romans using huge dogs in the arena: in his Cruelty and Civilisation: the Roman Games of 1972, Roland Auget makes no mention at all of dogs being used for combat in the arena. Reference is made here to the 'holding dogs', sometimes referred to by authors as seizing, gripping or pinning dogs. In other languages such dogs are known as Filas, Perros de Presa, Beissers, Mastinos, Alanos, Dogues or Dogges and Canes de Presa. 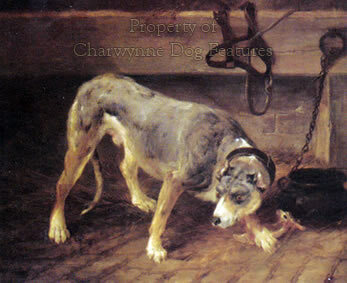 In the English-speaking world, they are sometimes termed catch dogs or capture dogs. The description chiens de combat or fighting dogs is not appropriate and demeans their value to man the hunter. In Germany the dog that seized the boar was known as the Saupacker, sometimes as Saufanger (boar-biter), with the Saurude being the boarhound. There is also reference to the 'Leibhund', literally the 'body' or 'torso' dog, 'auf den Leib gehen' means to press close upon; this was the holding dog that, often wearing body armour, closed with their quarry, seized and then ‘held’ it for the hunters to dispatch. Many of the surviving breeds of holding dog retain the instinct to 'pin' their prey rather than savage it. The mastiff diaspora is immense, ranging from the Filas, Alanos and Presas of the Iberian peninsula and South America (where the Dogo is known too), to the Canes and Neas of Italy, the Dogue in France and the Dogge in Germany. Historic references to 'mastiffs' abroad reflect the translators' choice not a reference to the Mastiff breed of England. 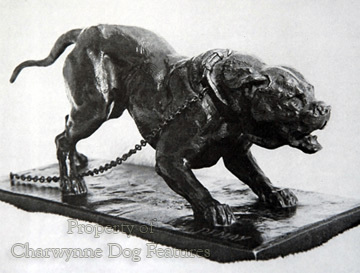 Many Bulldog researchers similarly see every historic reference to a 'bull-dog' i.e. the function, as referring to the neoteric breed of Bulldog. 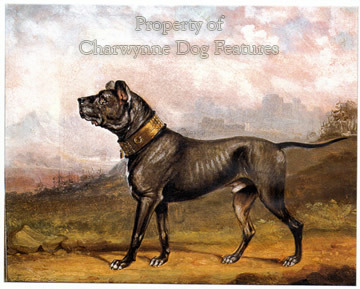 The dogs portrayed in scenes of bull-baiting are far more like today's Staffordshire Bull Terrier and have more claim to be called 'Bulldogs'; word origins too provide important clues to breed titles. 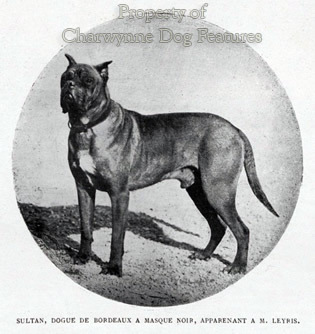 For me, the origin of breeds like the Bulldog and the Mastiff is better covered in an under-rated and under-valued book by the Scot, James Watson, his The Dog Book, in two volumes, of 1906, than in any other book of that time. 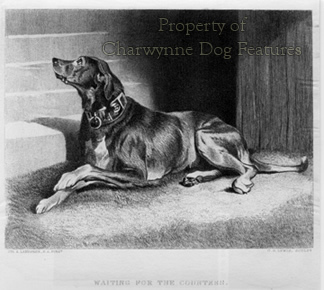 For many years, the Rev MB Wynn's History of the Mastiff of 1886 was held as the standard work, but Watson demonstrated very clearly the selective research and tendentious arguments used by Wynn in his desperation to show that the breed of Mastiff was an ancient breed and of English development if not English origin. 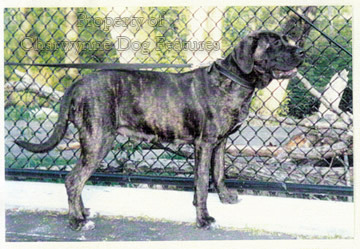 The Mastiff is not an ancient breed but has a long history as a breed-type, resulting in most European countries and some others developing a mastiff breed. "...mastiffs from Tartary, molossians from Epirus, hounds from Flanders..."